Re: Coil Overs perfect condition dirt cheap!!! hey guys i sold my accord 3 months ago and just about sold everything. What i have left are tein basic coilovers 1-3.5 inch drop. where only on accord for 2-3 weeks before i sold it. cheapest new anywhere are $855 shipped. im looking for $550 shipped obo. yes, its a complete steal. check out attatchments. how many miles on the tein setup? I have a set of 05 V6 Accord Rims for sale with Tires. Tires still have alot of life in them. 400 obo. Set of BRAND NEW 09 Accord 19" HFP Wheels with brand new BF Goodrich G-Force Rubber. Nubbies are still on the rubber. Asian Accord Honda Genuine grille available: 03-05 and 06-07 style. Last edited by MuGen7Modulo; 02-10-2009 at 03:56 AM. Bump for those sweet gems! Hey guys not on here a whole lot but hope can get some help!.. So im trying to get my friends Carbon Fiber hood from an 04 Accord Coupe.. I have an 07 Accord Sedan.. Would it fit?... Thanks! no it won't fit. sedans and coupes have different hood, front bumper and fender. only mods are the 17inch MSR wheels, custom taillights, and i now have tint. 10% rear and 30% front. car has a salvaged title but still runs beautifully. you can find my contacts on this site if you want to. I would be rather to help you. this is my moms and she's wanting to sell in order to get an older honda. if you have any questions, feel free to ask, and ill get the info to you. I hate to rain on ur parade but that price is too high. An 09 4cyl 5at coupe can be had for a little less being new. My friend bought an 08 v6 sedan for that price brand new. thats what i told my mom. ill take price shots for her lol. how bout that? yeah the chances of her selling her car is pretty slim esp in the situation we're all in right now. another thing she has to consider is that more people prefer automatics while only a few such as u and i prefer manuals. u guys should check the kbb used car value. I have 2006 coupe front bumper..nighthawk black pearl. Good condition just has some curb scuff on very bottom that you have to crawl under the car to see. asking 175-200. Email me at [email protected]. hey guys, i have $6000 !!! 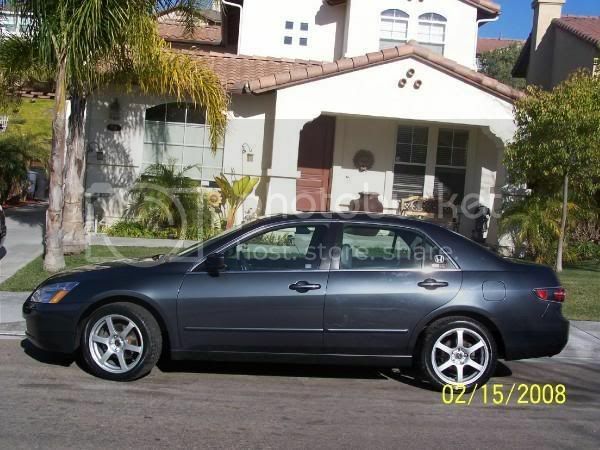 and im looking 2 buy an ACCORD 01-02 V6! !, OR an ACCORD 03 if 4cyl. has to M/T, or V6! !, also a 4DR INTEGRA GSR 99-01, LAST ACURA TL 00-03 !!! PLEASE HELP ME FIND ANY OF THESE CARS WITHIN 6GS THANKS...BUMP!!! Say you saw it in the Accord forum for a little better pricing. WTB: Stock leather 5-speed shift **** from all you Accord guys out there. PM me please.